All ports No Power passing design with blocking capacitors providing excellent intermodulation performance for low distortion interactive operation such as a Cable Modem. Tongue & Groove housing design provides high RFI Shielding for 130 dB. The Nickel plated zinc die-cast housing for perfect corrosion protection and grounding. High precision machine threaded F-ports with 360 degree base for full seating of sealing sleeve. F-ports with machine threaded spaced 1 inch center to center to accommodate security sleeve and tool. Printed circuit board ensures consistent RF performance and high port to port isolation. Applications vary from headend combining to typical drop installations. This Splitterseries should be used where increased bandwidth is being designed into the systems. Three Equal output Ports of (-5.5 db, -6 dB max.) for length independant applications. Note: This is a favorite amongst Cable TV and Satellite System Installers. Its Nickel Plated Housing is Epoxy Sealed from the Environment with a Tarnish Free Finish designed to Resist Corrosion due to Weather. 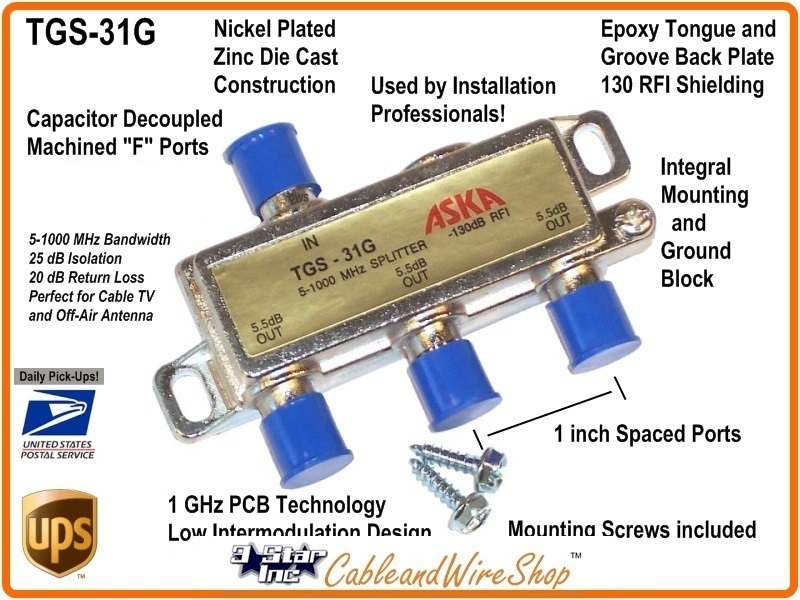 It will pass 1 GigaHertz worth of Forward and Return signals; making it perfect for Splitting Cable TV with High-Speed Internet and Pay per View DVR Box Connection Signals. When making RG6 or RG11 cable connections outside, a weather boot covering and some sort of Silicone compound are highly recommended.